Chinese and American students share the classroom at Coyote Creek Elementary in San Ramon. With the recent growth of China as both an academic and economic world power, relations with the United States have been one of the main focuses of international diplomacy. To reflect this, schools in China are partnering up with sister schools here in the States to allow Chinese students to explore the unique culture and to share some of their own with American students. 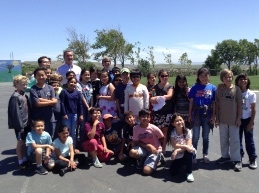 Just this past month, from April 25th to 30th, the Hangzhou Yucai Foreign Language School, a top elementary school, paid a visit to Coyote Creek Elementary School in San Ramon, an event that is in its second year. Hangzhou is located in Eastern China in the Zhejiang Province, and these 26 students and 6 teachers travelled a whopping 6,200 miles from their home to attend classes with their American counterparts. This experience has allowed them to open their eyes to a different world. Mr. Zhang, the principal of Hangzhou school, says that he hopes to give his students a real-world experience with American culture that they can keep for their entire lives. Also, he anticipates that there will be continued relations between China and the United States, making experiences like this imperative. To celebrate their arrival, Coyote Creek held a performance in which American students performed the beloved story of Peter Pan. But, there was a twist when some American students played a traditional Chinese instrument called guzheng. This instrument consists of 21 strings and has a similar sound to that of a harp. Mr. Zhang explains that he was shocked at the guzheng performance and notes how it represents physical evidence of the cultural exploration on both sides. To end the show, American and Chinese students sang and danced together, a true testament to the connections formed between these students. As the week went on, both American and Chinese teachers learned a lot from each other. Michael Biondi, the principal of Coyote Creek, said he was especially impressed with the Chinese students’ deep focus and emphasis on art and performing art. He said he hopes that he can mirror this curriculum in San Ramon. Mr. Zhang also said he was surprised at the involvement of American parents in their students’ education, and that he laments that Chinese parents do not volunteer to the same degree as American parents, but that he hopes to change that when he gets back home. Also, the Hangzhou school’s curriculum did not have much focus on outdoor play. After viewing the fun that children have at recess, Mr. Zhang said he wants to explore the option of painting hopscotch and “four square” lines to give his students more outside play. During their visit to the Bay Area, the Chinese students and faculty visited historic sites such as the Golden Gate Bridge, Lombard Street, and Stanford University. After their time in the Bay Area, they travelled to Los Angeles to spend some time at Disneyland and Universal Studios. All in all, the Chinese students had a great time learning about a different culture while still having time to enjoy the warm California sun. Mr. Biondi remembers that last year, when the Chinese students were ready to leave, the students from both countries began to cry. Over a span of one week, the students develop deep bonds and friendships that are moving for the teachers to see. Even though it is sad when the students leave for home, Mr. Biondi adds that as a school, the American students and teachers always look forward to their arrival the following year. Also, the students remain in contact through texting and emails, which allows them to maintain their friendships for years to come.